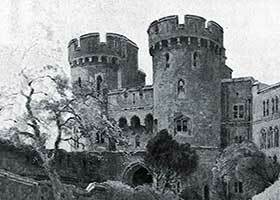 English castles, as we generally recognise them, were built of stone during the Medieval era. But the history of the English castle goes back much further! Exploring the History of the English Castle takes us as far back to the Neolithic Period - to Stone Age History! This section of the comprehensive castles site is unusual in that it describes the important milestones in the history of English castles. The full History of the English Castle provides fascinating facts and information leading up to the construction of the English Medieval Castle which can be accessed from the above links. The history of the English Castle therefore can date back to the time when people started to live in settled communities - the Stone Age! When looking at the History of the English Castle we need to look for people who worked together to create, or build, a safe retreat against intrusion or invasion! This would apply to people living in England during the Neolithic Period, the Stone Age then on to the people of the Bronze Age, the Iron Age, the Romans and finally on to the Medieval era. By the time we reach the history of the Renaissance period the castle was used as a symbol of wealth and power rather than a necessary safe haven against intrusion and invasion! At this point in time and history the castle was replaced with the 'Palace', a large or splendid residence. We travel back in the History of the English Castle to discover the Causewayed Camps and Stonehenge.